My preschooler son was perplexed by the moon yesterday morning. He noticed the moon in the sky after we finished walking my daughter to the bus. 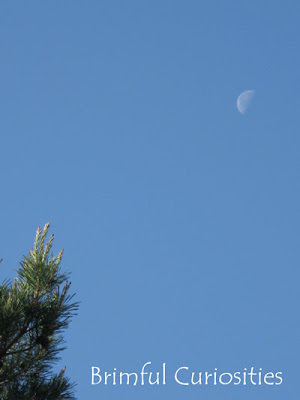 A moon during the day? It's not night! I think the explanation is a little complicated for him to understand right now. See NASA explanation: The Moon During the Day. I did tell him that the moon is always there. Sometimes we can see it, sometimes we can't. Time to read Moongame by Frank Asch! What's your favorite moon themed book? That is difficult to explain. But loads of fun to try. I love your nature pics! Great. Thanks for stopping today for WW. We made them a couple of years ago- I think with a store bought kit. Momma even has one! Great for amusement parks- everyone wear the same shirt so no one gets lost,etc. Enjoy your day- off to enjoy the sunshine! I noticed the moon big and bright yesterday too ( in the daytime) and almost took a photo of it. I like your shot better. Happy WW! I've had that conversation with my 5 year old before. Yep they don't get it. It's hard to explain! We've had similar experiences with my four year old. "But it's not even dark outside!" Very cool picture!